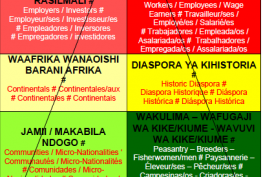 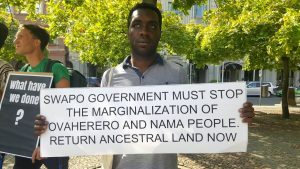 Home / Articles / Campaign / image / info / News / Publications / video / web / JUSTICE FOR OUR ANCESTRAL MARTYRS! 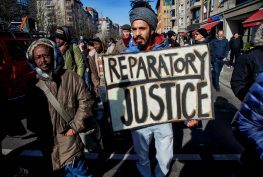 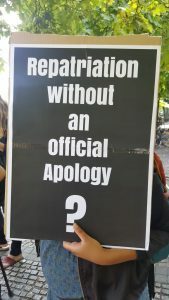 REPARATIONS NOW! 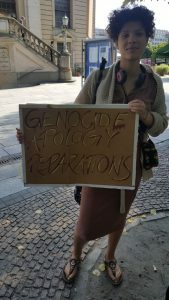 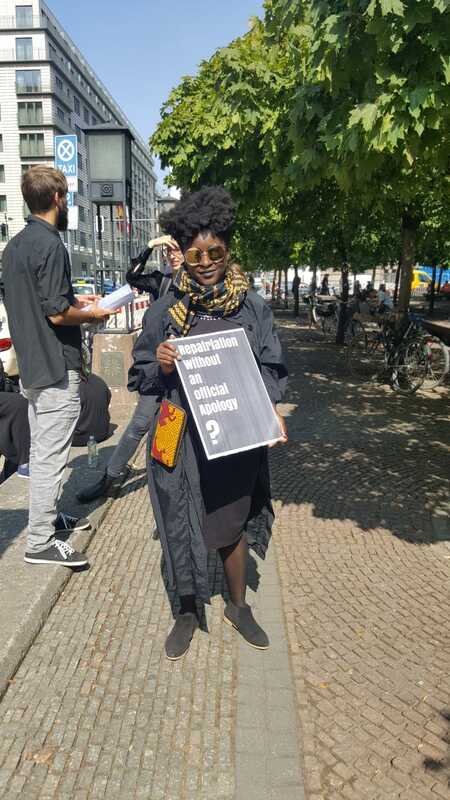 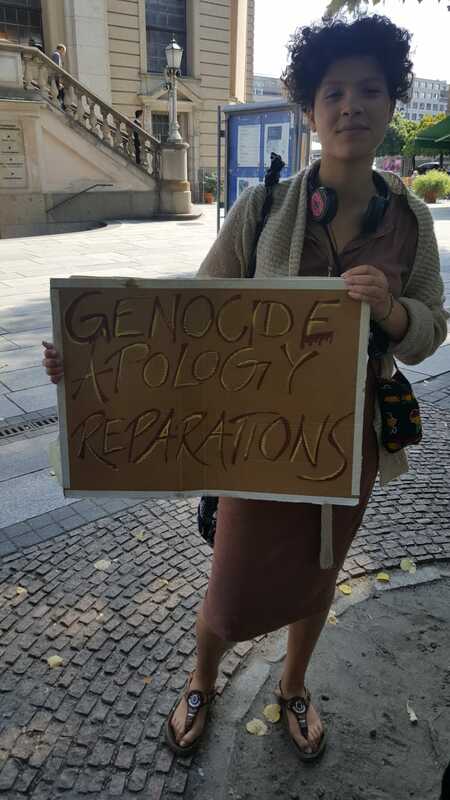 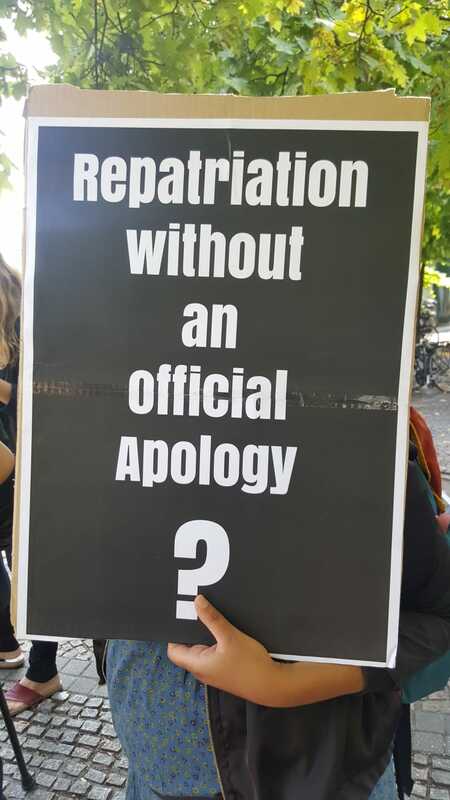 On Wednesday 29th August 2018, activists of the African / Black Community (ABC) in Berlin staged a protest/demonstration in front of the church in which the official ceremony of Restitution of the Remains of our Namibian Ancestresses and Ancestors was taking place. 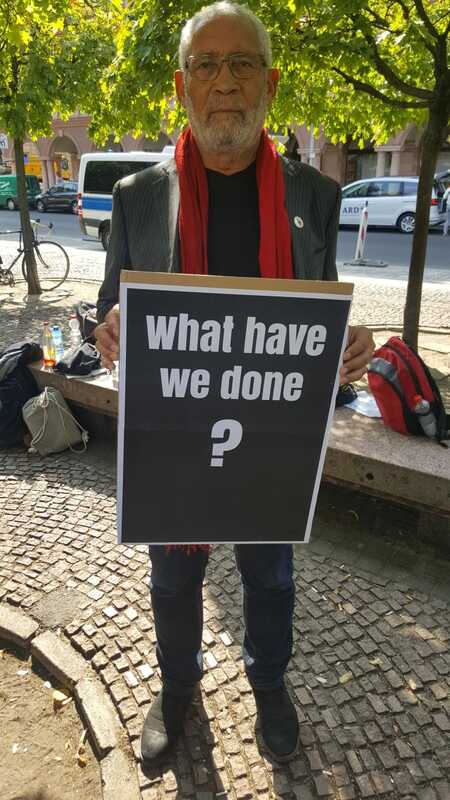 As you can see, our Berlin Sisters and Brothers were angry and defiant. 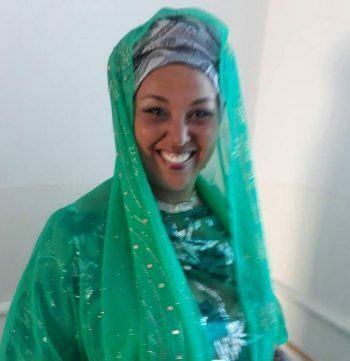 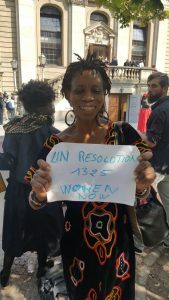 Indeed, the African/ Black Community in Germany is angry at the German government for downplaying its historical responsibility in the genocide, for disrespecting the Herero and Nama Communities, for refusing to officially apologise and for trying and escaping their obligation and duty to pay the Reparations owed to us. We are also denouncing and protesting the German government’s mean racist tactics and imperialist tricks aimed at dividing the Namibian People (the SWAPO Government and the Herero and Nama Leadership) as a way to weaken our Fight for Reparations. Lastly, Berlin Black Activists express disappointment and defiance towards the Namibian Government for giving the impression to play the game of the German government, instead of standing unconditionally and boldly at the side of its own people fighting for Reparations. 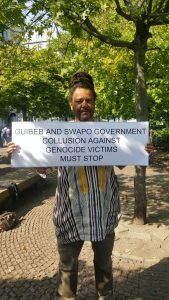 UNITED, WE STAND! 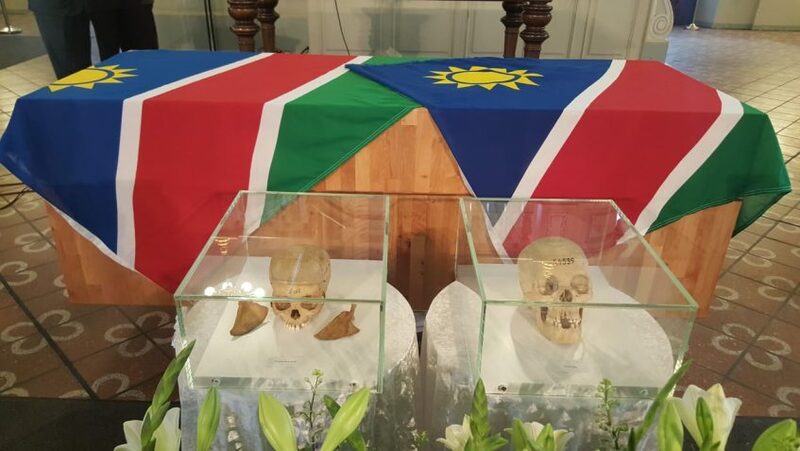 DIVIDED, WE FALL! 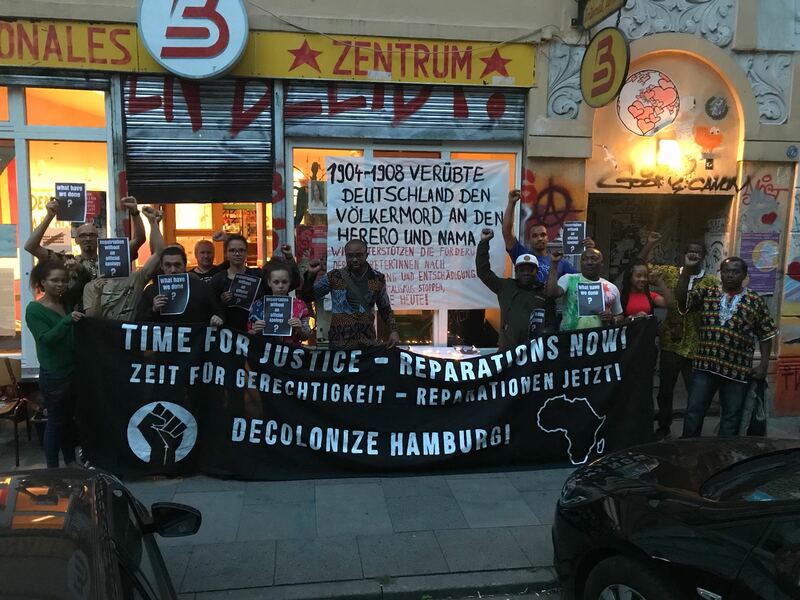 At our vigil (see photo below), the Black Community in Hamburg approved and endorsed the position taken by the Black Community in Berlin. 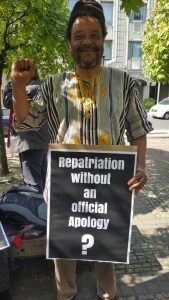 We also agreed that, in view of the worsening of the gap of distrust between the Namibian Government and the Herero and Nama Leadership, it is urgent that the Global African Family, especially all the African/ Black Activists who have been supporting the Namibian People in their Fight for Reparations as well as their Independence Struggle, to step in and intervene. 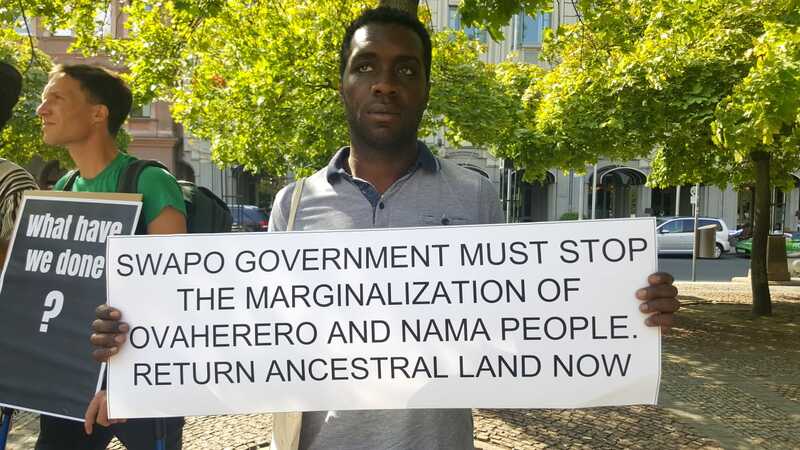 Indeed, we must do everything in our ability to restore Trust and Togetherness, and establish and strengthen a genuine cooperation between the Namibian Government and the Herero and Nama Leadership in order to prevent the German racist tactics of “divide and conquer” from prevailing. 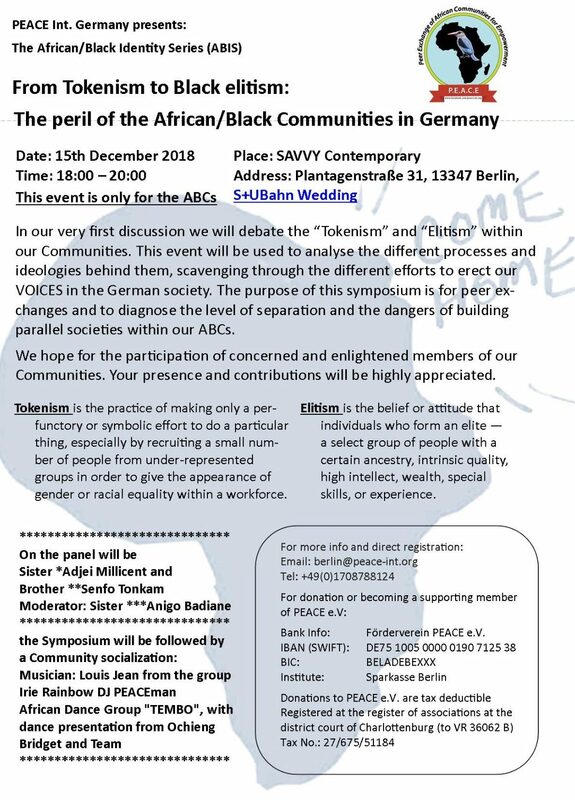 To this effect, all the African/ Black Communities in Germany are urged to adopt a common position and consensual agenda on this issue. 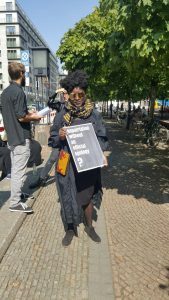 Thanks to the Sisters and Brothers of the African/ Black Community in Berlin for allowing these pictures to be taken and published.